The turmoil in Kashmir has worsened since the encounter of Burhan Wani last year (2016). The ceaseless protests, the handling of protests leading to deaths and blinding of many is very disturbing. To cap this negative development the attack on Amaranth pilgrims has added salt to the wounds of the nation. (July 2017) The tragedy struck when one of the buses, which lagged behind due to the burst tire of the bus. The terrorists smelling blood first attacked the police bunker and then chased the bus shooting recklessly. The bus was from Gujarat, the attack led to death of seven people including five women. The bus driver, Salim, in a brave gesture, kept driving despite being wounded, and that prevented the wholesale massacre. 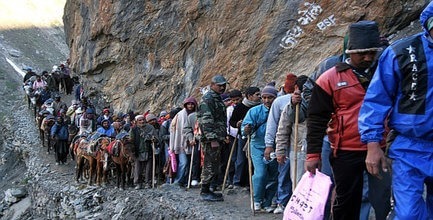 Amarnath yatra is among the most pious of pilgrimages undertaken by scores of Hindus. Amarnath is ice Shiva Linga located in a cave deep in the valley. This was discovered by a Muslim shepherd, way back in 1850s and since then it is a regular site of the devotees. The yatra is managed mostly by Muslims on the way and reflects to deep imprint of India’s syncretic culture. It also is a manifestation of Kashmiriyat, the culture of Kashmir, which is a synthesis of Buddhism, Vedant and Sufi tradition. Despite the rising militancy in Kashmir, the yatra has mostly been going on, though under heavy security cover. There are instances earlier also when the Yatra was attacked in 2001, 2002 and in 2003. Incidentally those were also the years when NDA was ruling. What is the correlation between the muscular nationalism practiced by BJP led NDA and such acts is a matter of conjecture. While there is communalization of Kashmir issue by the Pakistan inspired militants and Al Qaeda type elements who have infiltrated into the area, by and large the deep syncretism of the area has prevailed and the local Muslim population has been of great help to the tourists (Yatris) in their hours of crisis, in matters of supply of food when the yatris have got trapped due to natural calamities. Whole of Kashmir and nation condemned the attack in one voice. The nation was pained to no end. The prime Minister who takes long time to speak or tweet when Pahlu Khan or a Juniad is mob lynched was prompt with a series of tweets in condemning, rightly, the incident of Amarnath. This was in the aftermath of the massive turn out on Jantar Mantar after the killing Junaid in the train. The general impression is being spread that liberal activists-thinkers protest only after the atrocities against Muslims. This started being propagated more so after the ‘Award wapasi’ (returning honors) after the mass lynching of Mohammad Akhlaq. As such if we see even the award wapasi occurred once there was a qualitative change in the persecution of minorities with the coming to power of Modi Sarkar. Akhlaq’s lynching came as something very shocking the way he was murdered on the charge of killing calf/eating beef. Similarly Junaid’s murder in a train also was an event where the basic foundations of democratic liberties got shaken. The spontaneous mass protests after Juniad’s murder occurred in different cities of the country and did register the protest all around. As a matter of fact ‘Not in my name’ protest picked up and on similar lines and thousands collected to grieve the death of Amarnath pilgrims. So what does the propaganda of BJP spokesperson like Mr. Rao aims to achieve? Currently this tribe wants to spread the impression that the Hindu majority is suffering; and is being persecuted while the Muslims are being appeased-pampered in this country. Hindu nationalist politics drew strength from the propaganda first against Muslims and then partly against Christians. Currently it wants to defame all those who defend human rights of minorities. That’s the reason as protests of this kind have occurred more often and have drawn more attention. The idea behind this criticism of liberal democratic elements is to muzzle the voices of protests so that this BJP type politics constructed on intolerance for liberal values and violation of minority rights has an easy go in the society. Its main plank so far has been that minorities have been appeased and now it is going to next stage where the majority Hindu community is supposed to be suffering discrimination. This is a very shrewd move and a move which has no truth to support it. While their propaganda did sink into the social understanding the truth is far from that. In our country, the economic condition of Muslims is well reflected in the Sachar committee report, how over a period of last seven decades their condition has been falling abysmally. In matters of security and being victims of violence, over 80% of violence victims are Muslims, while they constitute 14.1% in the population as per the 2011 Census. In most of the acts of terrorist violence also, it is Muslim youth who had been arrested and most of them had to be released for the lack of any evidence. Their political representation is falling continuously as reflected in the number of Muslim Lok Sabha MPs. The majority of jobs in the Government sector, in higher echelons are occupied by people from majority community. The point is not that all from majority community are having a hunky dory life, but surely overall they are better off on most of the economic parameters. The perceptions being created about threat to Hindu community are a clever political move to further strengthen the polarizing politics. Will the fence eat the crop ?